On March 26, 2010, Florida Keys National Marine Sanctuary unveiled a new exhibit in its Florida Keys Eco-Discovery Center, dedicated to climate change and renewable energy. The exhibit kiosk includes access to a website displaying real-time energy generated by the more than 200 photovoltatic panels installed on the Center’s roof, as well as the carbon offsets of the energy generated. The thin, flexible solar panels, which use "peel and stick" technology, are able to provide up to 30 percent of the Center’s power and were the first of their kind employed at a NOAA facility. 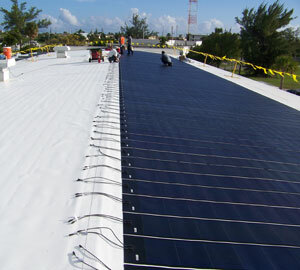 The solar panel installation was made possible through a partnership with the Florida Municipal Power Agency and Keys Energy Services. The exhibit focuses on the potential impacts of climate change on Florida Keys marine life and corals and provides actions individuals can take to lower their carbon footprints. Since its opening in January 2007, the Florida Keys Eco-Discovery Center has welcomed more than 320,000 visitors. The addition of this solar technology provides visitors a firsthand look at steps they can take to increase energy efficiency in their own homes and businesses. By applying and demonstrating new technology, the sanctuary hopes to inspire others to save energy and help to preserve natural resources, reduce pollution, and enhance energy independence. The solar panels were another element in the sanctuary’s commitment to resource conservation and going "green." The Florida Keys Eco-Discovery Center also switched to hand dryers to eliminate tons of trash produced by paper towels. The sanctuary also converted over to non-toxic biolubricants for its vessels, plus bio-derived cleaning solutions, insecticides, and herbicides.